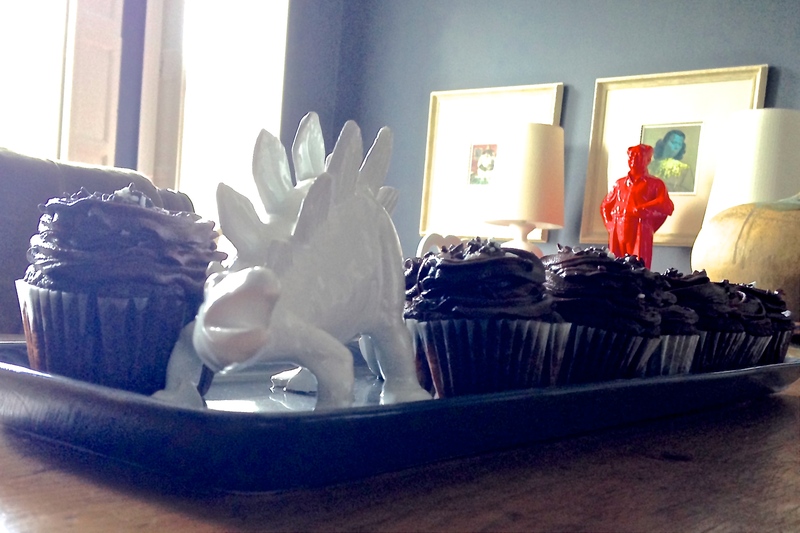 Saturday afternoon seems like a good time for a batch of Double Chocolate Cupcakes, especially when they are presented on our Dino plate. Love the way the dino is protecting the cupcakes, as well she should with Chairman Mao in the background! Here is a simple recipe, with guaranteed success. 300g dark chocolate, broken into chunks – It’s not crucial to use one with an impressively high cocoa content. Heat oven to 180C and line a muffin tin with paper cases. Whizz the chocolate into small pieces in a food processor. In the largest mixing bowl you possess, tip in the flour, sugar, cocoa, oil, 100ml soured cream, eggs, vanilla and 100ml water. Whisk everything together with an electric beater until smooth, then quickly stir in 100g of the whizzed-up chocolate bits. Divide between the cases, then bake for 20 mins until a skewer inserted comes out clean (make sure you don’t poke it into a chocolate chip bit). Cool on a wire rack. To make the icing, put the remaining chocolate bits, soured cream and 3 tbsp sugar in a small saucepan. Heat gently, stirring, until the chocolate is melted and you have a smooth icing. 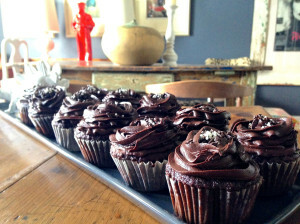 Chill in the fridge until firm enough to swirl on top of the muffins, then tuck in! Easy.